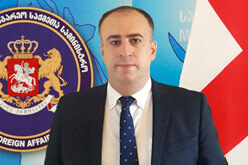 On 3-4 November 2015, the visit of the Deputy Minister of Foreign Affairs of Georgia, Mr David Dondua is being held in Strasbourg. In the frames of the visit, on 3 November, the Deputy Minister met the Secretary General of the Council of Europe, Mr Thorbjørn Jagland. During the meeting, the sides discussed the ongoing and the future cooperation between the Council of Europe and Georgia. The Georgian side provided the updated information on the human rights situation in the occupied regions of Georgia. Among other issues, the Secretary General reaffirmed the Council of Europe's firm support for Georgia's sovereignty and territorial integrity. He also stated that the practice of presenting consolidated reports on the conflict in Georgia by the Secretary General will continue and the issue of the "Council of Europe and the conflict in Georgia" will remain on the organisation’s political agenda in the future. In the frames of the visit, the Deputy Foreign Minister held meetings with the Director of Political Affairs, Mr Alexandre Guessel, with the Permanent Representatives of the EU member states and other high level officials of the Council of Europe.